Posted April 10th, 2013 - News Posted for ISA News. Day 4 of the 2013 ISA World Masters Surfing Championship was greeted with an increasing swell and a beautiful, sunny day. The morning had an extreme low tide and the contest was put on hold to allow for the conditions to improve and showcase the best performances from the world’s best over-35 surfers. Once the tide was more favorable, the expected new swell began to show signs of life. Conditions improved throughout the day with 3-5 feet waves and occasional overhead sets by the afternoon. The long period South swell is expected to continue to build further with surf in the 5-7 feet range tomorrow, as predicted by Surfline, the Official Forecaster of the ISA World Masters Surfing Championship. The fourth day of competition was primarily Repechage, rounds featuring every division: the Grand Masters (over 40), Kahunas (over 45), Masters (over 35), Grand Kahunas (over 50) and Women’s Masters (over 35). The only non-Repechage heats were the Grand Masters Qualifying 3. The Repechage includes all the surfers that have failed to advance in the Qualifying heats. Once in this round, if a surfer places 3rd or 4th, they are no longer in the competition. The surfers that advance have a chance to make it to the Grand Final. Day 3 began with the Grand Masters, where the surfers over 40 battled the rising conditions. Marcelo Alves from Brazil had the best performance in this division, posting a total heat score of 13.46, overcoming Martin Jeri from Peru who achieved 9.86 points, placing second, both advancing to the next round. Unfortunately this meant the elimination from the competition of Masanobu Koga (JPN, 5.16) and Ricardo Carbia (PRC, 4.03). Next were the Kahuna’s, which saw a great battle between Argentina’s Horacio Ipucha and Costa Rica’s Craig Schieber. The Costa Rican began with the lead, but in the last minute the Argentinian took the lead by earning a good score and leaving his opponents behind. Ipucha scored 12.74 barely defeating Schieber’s 12.43. The two surfers that were eliminated in this heat were Eduardo Mendez (URU, 3.23) and Guillermo Palfy (URU, 1.77). In Masters, Brazil’s Rogeiro Dantas was the standout earning a 15.50 total heat score defeating Alejo Martinez (ARG, 8.37) and sending home (CHI, Kriz Cabezas and the local Andres Fernandes (ECU, 4.10). South Africa’s Chris Knutsen had a stellar performance posting a total heat score of 17.23 easily defeating his opponents Santiago Melus (CHI, 2.70) and sending home Osbaldo Chavez (MEX, 1.77). Knutsen’s teammate in the Women’s Masters, Heather Clark, advanced in her heat earning an 11.66, defeating Lucila Gil (ARG, 4.67) and sending home the local Iliana Crow (ECU, 1.50). To finish the day, the Grand Masters Qualifying heat hit the surf, and Hawaii’s Sunny Garcia kept his momentum with just enough points, 14.67, to defeat Dani Garcia (ESP, 13.16) and sendScott Schindler (AUS, 11.27) and Glen Pringle (AUS, 3.47) to the Repechage round. The ISA World Masters Surfing Championship resumes tomorrow at 7:40am with The Morning Show hosted by Mark Fewell, which will be broadcast live on the internet at www.isawmsc.com. 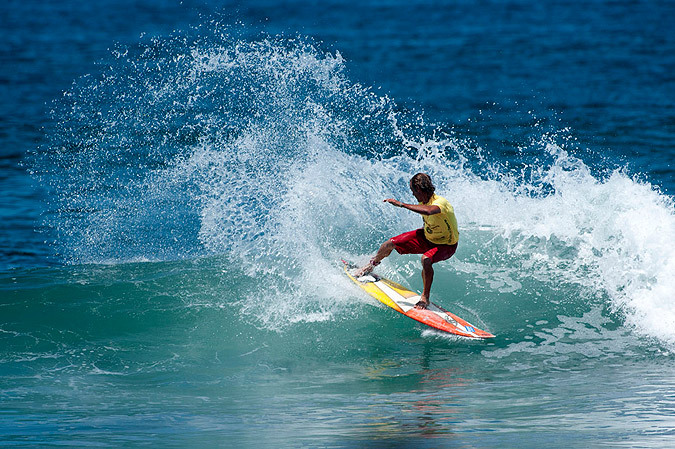 ISA membership includes the surfing National Federations of 106 countries on five continents. The ISA is presided over by Fernando Aguerre (ARG). The Executive Committee includes four Vice-Presidents Karín Sierralta (PER), Kirsty Coventry (ZIM), Casper Steinfath (DEN) and Barbara Kendall (NZL), Athletes' Commission Chair Justine Dupont (FRA), Regular Members Atsushi Sakai (JPN) and Jean Luc Arassus (FRA) and ISA Executive Director Robert Fasulo as Ex-officio Member.